1 of 6 Line a 13 x 9-inch baking pan with foil. Coat foil with nonstick cooking spray. 2 of 6 In a large pot, melt butter over low heat. Stir in marshmallows and continue heating until completely melted, about 5 minutes. 3 of 6 Stir in cereal until evenly coated with marshmallow mixture. Pour into prepared pan and press in evenly with greased hands. Cool completely. 4 of 6 Place chocolate and oil in a glass bowl. Microwave at 50% for 1 minute. Stir and continue to melt at 50% in 30-second increments until a few lumps remain. Stir until smooth. 5 of 6 Cut cereal bar into 24 pieces. Dip one end of each in chocolate to coat, shake off excess and place on a wax-paper-lined sheet pan. Let dry 30 minutes. 6 of 6 Remelt chocolate. 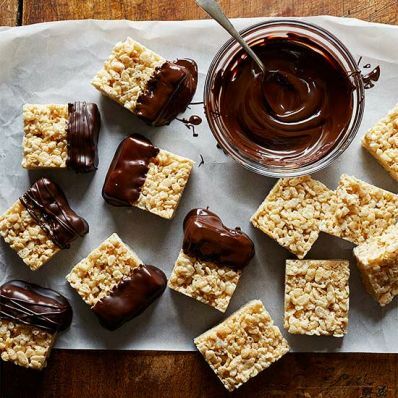 With a spoon, drizzle remaining chocolate over dipped end of each bar. Let dry 30 minutes. Per Serving: 15 g sugar, 1 g fiber, 25 g carb., 3 g sat. fat, 6 g Fat, total, 148 kcal cal., 48 mg sodium, 2 g pro.